Contradances viewed from the stage. I've long thought that contra dance bands would make great performance bands. Actively blending popular traditions from Celtic to Cape Breton, old-time to bluegrass, with hints of Scandinavian and French- Canadian influences, contra dance bands should have laser precision and the ability to turn on a dime. Of course, the problem is that most contra dance bands are used to playing 15 minute long medleys of highly repetitive tunes, so some work has to be done to adapt a contra dance band to a concert stage. Here are three bands that have developed musical styles so tight and compelling that if they're not playing concert venues now, I hope they will soon. Next generation contra dance band, Night Watch, come from the heartland of the tradition, New England, and sound like they've spent many a night playing for swirling lines of dancers in old, vintage dancehalls. Night Watch is one of a growing number of bands that have made the transition from dance band to concert band. Or at least, their debut album, Splendid Isolation, proves that they've got the chops to show just how powerful contra dance music can be for listeners, rather than just dancers. Irish, Scottish, French-Canadian, Scandinavian, but also the true contra dance band's love of newly composed tunes, both from friends and band members. In fact, the tunes composed by band members in Night Watch (each member is a tune composer) are some of the best tracks on the album. Accordionist/pianist Elvie Miller's Dromore Wood is a remarkably lovely waltz named for an inspiring spot she visited in Ireland's County Clare. Mandolin/guitarist Owen Morrison brings two killer reels, Javelina Hunt/Hops and Barley that are clearly perfect as a dance medley, and fiddler Naomi Morse brings The Tulip Tune, a charming reel that reflects her grace and light touch on the fiddle. Contra dance tunes can rely too much on cheap tricks, like rockin' arpeggios, or overtly-minor-key noodling, so it's a real pleasure to find such beautifully crafted tune written by young contra dance musicians. As a contra dance fiddler myself, I would happily learn any tune on this CD, which, for me, is a very rare compliment. Also as a contra fiddler, I know how easy it is to cut an album of tune after tune in long medleys with little variation. The best part of Night Watch's album is that they've taken the time to beautifully arrange each medley. Instruments drop in and out, keys change, tunes modulate, and each track sounds fresh and invigorating. Night Watch shows that the music of New England's contra dance traditions is in very good hands. On their new album, Five Gears, The Syncopaths are tapping into a chamber folk world of complex, choppy rhythms and instrument virtuosity that has propelled bands like Crooked Still to the top of the folk charts. It's a great sound and they wear it well. To make this style their own, they've adopted contra dance music traditions to lay their musical foundation. Each member of The Syncopaths is a tried- and-true virtuoso on their instruments. Fiddler Ryan McKasson cut his teeth in the wonderful family band The McKassons. Based in Scottish fiddle traditions, The McKassons were one of the best Celtic bands to come out of the Northwest and could have easily toured all over given the caliber of their music-making. Mandolinist Ashley Broder joins the band from her previous tours with fiddler Jamie Laval. She's a monster picker, bringing in strong counter-point harmony and dead-set melody playing and an ability to jam without sounding generic, a very difficult thing indeed. Pianist Jeffrey Spero provides wonderfully varied accompaniment of the rare sort that manages to draw out sides of the music you've never heard before. Thumbs up for that! But the real pleasure of The Syncopaths for me is the singing of Christa Burch. It's not common for contra dance bands to include songs, so this is a much-needed departure from the tradition. And her voice is so sweet and smooth, that when put together with the bands' rich arrangements, you have one hell of a great sound. I think of The Syncopaths as the Ani Difranco of the contra scene. They're a helluva band to try and imitate and I doubt anyone could do justice to their virtuosic tunes, but they surely rock the hell out of a contra dance! With a busy schedule of touring, it's clear that I'm not the only one realizing how hot this band is making contra dance music. Elixir is a band that's been getting lots of plays on folk radio around the US, and on their new album, Rampant, it's not hard to hear why. 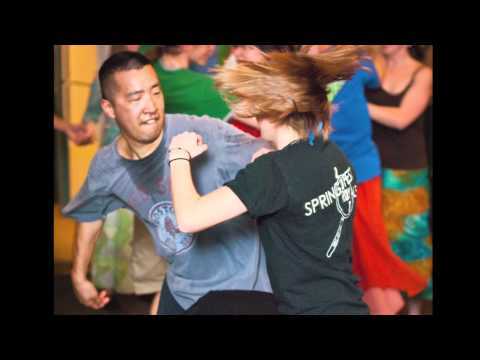 They meld exciting brass arrangements with traditional and non- traditional contra dance music. It's pretty impossible not to dance when you've got a hot horn section pumping out riffs. I also really like that the caller, Nils Fredland, is part of the horn section. I haven't had a chance to see them live yet, but I've got huge respect for anyone that can call and play an instrument. It used to be that callers also fiddled at the same time. I can't imagine the talents it would take to do that, especially when I can barely blurt out the key while playing fiddle. Elixir's a bold band, no doubt about that! Their arrangements are complex and beautiful and they're one of the best folk bands to successfully incorporate brass instruments. Even a megaband like La Bottine Souriante has been infamously spotty at this kind of work (though they've got a great new sound now). And speaking of La Bottine Souriante, it's great to hear the traditional French-Canadian footwork (podorhymie) from fiddler Ethan Hazzard-Watkins, who also gets some of the syncopated bowings of this tradition. Throughout, Hazzard-Watkins' fiddle is one of the leading sounds of the band, at times soft and heartfelt, at times blazing along at a great clip. Guitarist Owen Morrison (also of Night Watch) joins the group and lays down not only a powerful foundation, but also some sweet flatpicking on tracks like The Derry Reel. Excellent clarinetist Anna Patton and trumpet player Jesse Hazzard-Watkins round out the ensemble and form the core of the brass/woodwind sound. Elixir is really the perfect contra dance band, able to pull off a huge band sound without filling the stage with members, and able to pull off sweet and subtle sounds as well. Devon Leger was the lead booker for the annual Northwest Folklife Festival for the past six years, during which he worked to connect a new generation of folk musicians with this veteran festival. Now he works on his arts promotion agency, Hearth Music, planning concerts, promoting artists, and blogging. Visit www.hearthmusic.com to find out more.